For the past several months, pieces from the estate of Allen DeLoach have been auctioned on eBay. These items, including photographs, small press chapbooks, little magazines, and manuscripts, chronicle the counterculture literary scene of the 1960s and 1970s. In my opinion, they rank as some of the most exciting material up for sale on the internet. I wrote a column on a manuscript for sale by the estate a few weeks ago. Once again, a couple of items from the DeLoach collection piqued my interest. The first is an original cassette from a reading Allen Ginsberg gave at the University of Buffalo in March 1966 just before the publication of Wichita Vortex Sutra. (PDF) The second is an original cassette of William Burroughs reading at the University in December 1975. (PDF) The Ginsberg cassette features classics like Kval Majaks, sections from Wichita Vortex Sutra, and At Ken Kesey’s House – Hells Angels. Several other poems are on the tape but not listed. 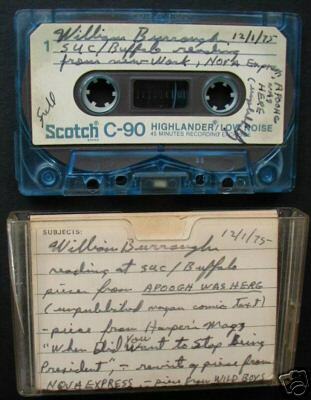 Burroughs’ tape contains a reading of Ah Pook is Here (entitled “APOOGH is here”), the “When Did You Stop Wanting to Be President” piece for Harper’s Magazine, and bits of Nova Express and Wild Boys. With a quick glance and not knowing all the Ginsberg poems, I assume that all the material on these cassettes have been collected in the Burroughs and Ginsberg CD box sets in some form. What is exciting is that these particular readings might be completely undocumented, except for these original cassettes. I take it that these cassettes are the only recording of the events. I can only compare them to a one of a kind bootleg of a Bob Dylan or Grateful Dead show long thought to be lost to posterity. Mass produced cassettes by Burroughs or Ginsberg appear on the collectible market occasionally. Abebooks features several Burroughs cassettes including Junky, Naked Lunch, or You’re the Guy I Want to Share My Money With. EBay offers a cassette of a Naropa reading of Ginsberg and Anne Waldman. These tapes sell for $10-15. What is the market for these one of a kind tapes? As these auctions show, there is a market and quite an expensive one. The Ginsberg tape sold for over $300; the Burroughs tapes received bids at around $200. I am ambivalent about these tapes. Part of me would love to hear these largely forgotten readings. Perhaps Burroughs and Ginsberg were especially good those nights. Maybe they felt talkative between readings and answered questions, spoke about their work, or reacted to the audience. The content of the tapes is fascinating. Less interesting is the format: the audio cassette. I am attracted to the fact that audio cassettes are a dead technology, like vinyl. Yet I love the feel of vinyl. This includes the act of placing an LP on the turntable and of course the pops and crackles of the sound. I do not get the same feeling pushing play on a walkman. In addition, the record and its packaging appeal to me as object and art work. The LP cover is large and substantial, a physicality that can be read and handled again and again, like a book. I cannot do that with a tape. That said there are several tapes that I would love to own. Charles Bukowski appears on a number of tapes reading his poetry. I am certain he has been bootlegged over the years. One particular tape stands out for me: a limited edition reel-to-reel tape issued by Black Sparrow in 1968. Bukowski reads from At Terror Street and Agony Way, an early collection. Black Sparrow put out 50 signed reels. The tapes came with a handmade plastic box with a photo of Bukowski on the cover and his name in colored plastic letters. The signature, tape, photograph, and box make the item irresistible to me. Black Sparrow knew how to issue a collectible limited edition. This item fetches over $500 on the market now. In 1967, Carl Weissner, the man who popularized Burroughs and Bukowski in Germany, issued a 23 minute tape of Burroughs reading Nova Express. Weissner was a concrete poetry pioneer. I believe the tape came with an issue of Weissner’s influential magazine, Klactoveedsedsteen. The magazine, named after a Charlie Parker song, published sound and text experiments. Burroughs’ tape experiments were transcribed for a few issues of the magazine, most notably in Klacto 23. These transcriptions are similar to the experiments included on the LPs Break Through in Grey Room and Nothing Here Now But the Recordings. See my column on those records. As mentioned in other columns, tape and tape experiments were very important to Burroughs’ creative project in the 1960’s. In fact, Burroughs’ essay “The Invisible Generation” posits the theory that tape and tape recorders have the power to change world events and be a force in the counterculture revolution. During the period of the recording in Buffalo, Burroughs was still fascinated by the possibilities of tape. In 1976, he lectured at Naropa about his theories on audio tape. In the mid-1960s when the Ginsberg tape was recorded, Allen Ginsberg also experimented with tape recorders although not as a weapon of insurrection. Ginsberg also shied away from the sound and cut-up experiments performed by Burroughs, Gysin, and Ian Somerville in the Beat Hotel. Instead, Ginsberg used a tape recorder, given to him by Bob Dylan, to utilize and to explore the spontaneous prosody techniques of Jack Kerouac. As Ginsberg drove from coast to coast, he composed the poems that comprised The Fall of America on a tape recorder. As a result, Ginsberg’s immediate sense impressions and thoughts could be recorded as quickly as an action occurred or an image appeared. Kerouac’s sketching technique received a technological spin. These experiments by Burroughs and Ginsberg make the presence of tape in the audio cassette a little more pertinent, but an actual reel of tape would be even more interesting. 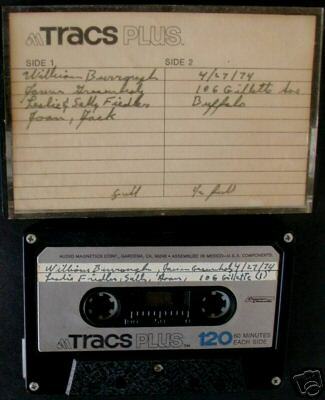 As one of a kind artifact, as dead technology, and as a key component of Burroughs and Ginsberg’s artistic process, the audio tapes for sale on eBay prove desirable on many levels. Hopefully, these readings will someday make their way onto CD or better yet the Internet. In addition to the two cassettes mentioned above, a tape of William Burroughs in conversation is also for sale. (PDF) Burroughs talks about Mexico, London, Africa, drugs and other matters. For those interested in hearing readings and lectures similar to the material on this tape, I encourage going to archive.org. Anyone interested in the Beats and post-WWII literature in general will find a goldmine of material here. The full value of the Naropa archives remain to be discovered, but this site is a start. You can lose yourself for days on this site. The Grateful Dead recordings are not bad either. Enjoy!! Written by Jed Birmingham and published by RealityStudio on 11 April 2006. Thanks for the info. As a luddite committed to ‘dead technology’ like hard copies of literature and of late, audio cassettes, all I can say is bring it on. Makes them more available to us monks keeping the flame alive. Just uncovered original recording 60 minutes vintage cassette by WSB made in the middle to late 1960’s [date evidence is Vic Damone song, Selma news reference from 1965, tape process similar to reading held in April 1965 in NYC – this is probably from around that point – number of radio stations are NYC] [tape itself which was in use from middle 60’s on] Title is PORT OF SAINTS [but I think I may have supplied – based on parts of scrapbook that was used in the making of PORT OF SAINTS]. WSB reading his own writings from a variety of sources interspersed with radio broadcasts and static. Quite similar in feel to his scrapbooks. I purchased from William c. 1971 and it has sat in a forgotten box of tapes since then. There was also a recording made by Paul Blackburn of Ed Sanders in 1965 + Ginsberg, Corso and others. There are a host of open reel tapes….waiting for a machine to arrive to audit these. Hoping that the lost LAST WORDS OF HASSAN I SABBAH might be among these. Update next week – a rare event and quite exhilarating. That sounds so exciting, Richard. Keep us posted. Also very interested in how this goes, Richard!